Message Campos Construction Co., Inc.
Cris Campos and his team were professional, thought through challenging construction/design issues and facilitated critical permiting at Coral Gables Zoning & Building Dept. They outstanding job with the renovation kitchen, outdoor patio, trelis and windows. Hiring Campos Construction to remodel my house was the right decision. They are professional, reliable imaginative and know The Gables rules. They were always available to address our concerns. We were so satisfied that our daughter and her husband hired them to remodel their house. We came to Campos with a project abandoned by another builder and came away with an absolutely beautiful back patio, trellis & kitchen. Cris Campos is as trustworthy and honest a man as you will find, who values integrity and craftsmanship above all else. He hires great people and he always strives to do what is best for the project, not for his bottom line. Cris saved us literally from a disaster and we will be forever thankful to him and forever proud of our remodeling project. In these times of turbulence, hardships and lacking customer service is rare to find a gem in the construction industry. That gem is CAMPOS CONSTRUCTION CO Inc. Our project consisted of an addition of approx 1,900 sqf. Originally we had hire a general contractor/builder for our addition. After 2 1/2 years of promises, excuses,& lies the plans were not approved by the city because of the lack of experience and knowledge. At this time we met Cris Campos he promised that he would take over the project and finish the plan and get the permits. We were very skeptical of this. After approximately 3 months the plans were finished and the city issued the construction permit. The construction was performed ahead of time, in budget and stress free. The honesty, integrity and quality of Campos Construction is legitimate. The project was done hassle free and without any problems. We strongly recommend Campos Construction Co Inc. The best contractor in Coral Gables!!! Have done two other projects with other contractors, and there is NO comparison !! Excellent performance!! Knowledgeable, experienced, professionals, honest. What more could we have asked? Our experience with Campos Construction was exceptional from the beginning to the end. Cris, his workers and subs were all extremely professional, timely and honest in all of our dealings. Cris is the only contractor that I know, or person for the matter, that always answers his cell phone!!! I highly recommend Cris and his team! Will do another project with them as well as recommend this contractor to any one with 100% personal confidence that they will do an excellent job. This father and son team are very honest, knowledgeable and professional. Last year Campos Construction installed storm windows and new hard floors in our home. Cris, Ray and other subcontractors did a very professional job. Cris was always available to discuss any issues and answered promptly and accurately all our questions. The work was excellent, and we are very pleased with the results. We will surely call upon Cris for any needed work in the future. Campos Construction stayed ahead of schedule throughout and on budget. The quality of the work is second to none. He was always reachable, either through cell phone or email, which is very comforting to the customer. A few months ago Cris Campos finished a major remodeling and expansion of our home in which we doubled the size of our house. Before we started, Cris gave us an estimate and told us that when we finished the project, we would be good friends. That has truly been the case. The job that Cris and Cris Jr. did was very professional and reliable in every sense. His working crew was always on site and willing to accommodate the owners. We recommend Campos Construction Co. highly and assure you that you will be please with their work. I was very afraid of getting involved in a construction project. However this contractor made me actually enjoy the experience. They know their business!! In the last 20 years I have renovated 10 homes using different contractors that promised everything and only delivered excuses and delays. With Campos construction I received what I was promised and more, great team of father and son. Everything that was promised was completed to 100% satisfaction. Honesty, Integrity, Quality ... words to describe Campos Construction!! When my wife I decided to to go forward with an addition we really had no idea what to expect. 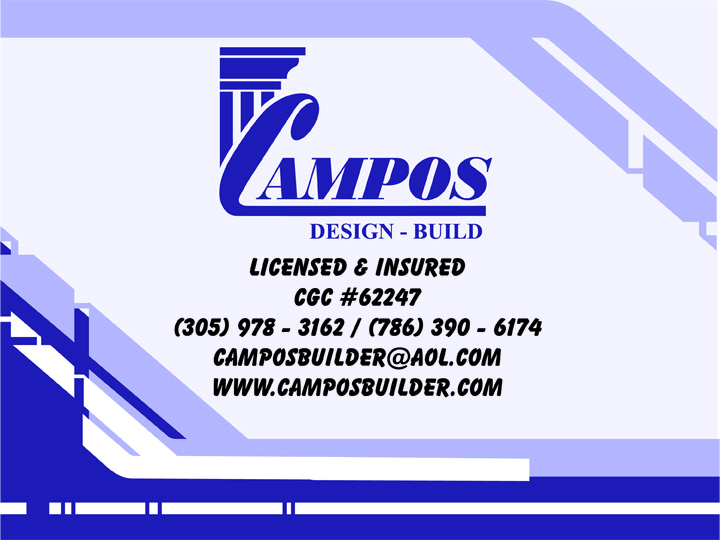 When we hired Campos Construction we immediately knew we had made the right decision. Not only did they deliver a quality product.. they delivered it as scheduled and within budget. Additionally, they dealt with City Hall and with our Architect in a manner that was practically transparent. My wife and I have several home projects in mind and we fully intend to hire Campos Construction once again. From the initial meeting and discussion of projects to the final day of service we found Campos Construction to be honest, accurate, on time caring, and delivering a high standard of quality in material and workmanship. You rarely find these qualities in recent years. A very knowledgeable, professional and honest contractor. These are qualities that are hard to find in today's construction market. Campos Construction delivers on what they promise on time and on budget. They keep a clean construction site and they provide high quality product. Thanks to Cris's extensive knowledge of the Coral Gables building codes and his drive to provide a quality product, navigating the city permitting and inspection process is a seamless endeavor. We would use them again in the future and we would definitely recommend them to anyone considering a construction project (especially in Coral Gables). This contractor was a pleasure to deal with. He was honest, straight forward, and operates with the highest integrity and professional conduct. I would hire him again without reservation. During the most impossible of times with 2 hurricanes, family illness and construction material shortages Cris and Cris, Jr. went above and beyond the call of duty to work with us and finish the job. It was a heck of an adventure. Their honesty is above reproach, he probably still has the key to our house and I don't even worry about it. I have absolutely no hesitation about recommending this contractor. They worked with us and had many suggestions that save us money and ended up looking better than some of our original ideas. Both are honest, dedicated, intelligent and knowledgeable individuals. Under the able guidance from Cris the work performed was done in a very satisfactory fashion and he knew how to navigate under the gruesome, time consuming, complex and cumbersome permit system of coral gables which are frankly up to whims of whomever you get to review your project. The work was done entirely to our satisfaction notwithstanding all the obstacles placed by the permit and inspecting authorities. Cris and Cris Jr. are a pleasure to work with. Cris applies his years of management in "corporate America" to effectively manage projects and relationships. His "Can do" attitude is something everyone of us should have. Cris Jr. 's intelligence and will to work is incredible. After our project was completed, Campos Construction stood by their work and followed up on the smallest of issues (i.e., loose toilet paper holder). This Father/Son tag-team is tough to beat.